"Bulgarian and Romanian migrants would be nearly nine times better off if they move to Britain when access ­restrictions are lifted at the end of the year, a study revealed yesterday." "Romanian families migrating to Britain next year could be almost eight times better off here working for the minimum wage, a study revealed yesterday. Similar families from Bulgaria could increase their living standards nearly ninefold, according to the report." "IMMIGRANTS from Romania and Bulgaria would be five times better off if they moved to Britain." A study published yesterday by Migration Watch highlights the economic incentives for Romanian and Bulgarian migration to the United Kingdom. The organisation argues that Romanians and Bulgarians - single people as well as families moving together to our shores - would be five, eight or nine times better off in the UK than in their home country. The figures were used interchangeably across yesterday's press. So why the difference? The increased income depends heavily on whether the person moving here is a single worker, employed in a job that would earn them the minimum wage or an average wage, or the head of a big household seeking child benefits as well as full-time employment. It also depends, of course, on what their original wage was back home. For example, in Romania a family on the average wage would have a weekly salary of 420 Romanian Lei, the equivalent of £141, when living costs are taken into account. The same family on the minimum wage in the UK, according to Migration Watch, would earn almost four times the average wage at home. 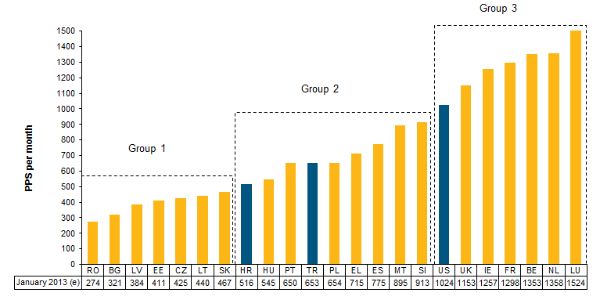 Eurostat has also collected data on monthly minimum wages as of January 2013 in EU Member States, which for comparative reasons includes non-members such as Croatia, Turkey and the United States. The figures are in euros. Romania and Bulgaria are indeed at the bottom of the pack, whereas the UK is part of that third group of member states - including France, Ireland, the Netherlands, Belgium and Luxembourg - in which the minimum wage is above €1,200 per month. Migration Watch UK also argues that the economic advantage would be even greater for families. Here we find the figures that featured on some headlines. Families from Romania and Bulgaria are set to be between eight and nine times better off than they were in the UK, provided the head of the household finds employment which entitles them to the average wage. 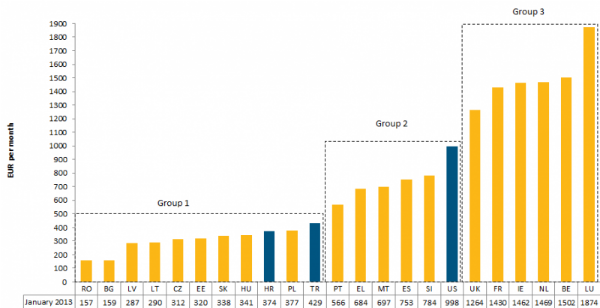 "In Romania a family of four (an individual with a dependant spouse and two children) on the minimum wage would have a weekly income of 208 Romanian New Lei. Once the cost of living has been accounted for, this equates to £70. (See Table 3) In the UK the same family would have an income of £543, which is almost eight times what they could earn at home." "A family on the average wage would have a weekly take home pay of 156 Bulgarian Lev. (Table 6) Once the costs of living have been accounted for this is the equivalent of £131, so a family on the UK minimum wage would earn four times the average wage in Bulgaria. (Table 4)"
According to Migration Watch, the incentives that we've looked at so far "would be far higher for the Roma, many of whom receive no benefits in Romania, if they were to migrate to the UK"
The footnote goes on to explain that "Many Roma in Romania and Bulgaria are unable to access social welfare because they do not have a national insurance number. National Insurance numbers can only be allocated to people who have a fixed abode." "There are a number of things a person needs to satisfy to gain a National Insurance Number, your visa, your working or student status, etc. None of these things are treated in isolation and a claim will be looked at in the round. Address will be looked at with all other evidence but the very least a person must have for a National Insurance Number is a correspondence address." "Research on Roma's experience of the labour market within the European mainland... points to endemic and blatant employment discrimination against Roma, barriers between Roma and non-Roma in employment, Roma being fully absent from the workforces of major sectors of employment and their limitation to those sectors which involve solely delivery of services to other Roma, with particular difficulties faced by women"
Are wages going down because of immigration? Is the government sending £36 million of Child Benefit abroad?